The We Remember website provides information about the 32 students and faculty members who were tragically taken from their loved ones and our community on April 16, 2007. They ranged in age from 18 to 76 and represented a variety of academic areas and faith and ethnic groups. We hope that you are able to reflect on the tremendous promise each of them embodied for our world with creativity, intelligence, humility, and humanity. This site also provides information about online resources, latest news and events, information about the April 16 Memorial, and links to previous years' events and support information. Live for 32. Seating will begin at 1:30 p.m. Please note there will be no late entry permitted to the service. The ceremonial candle will be lit by representatives of the student body and the names of the 32 Hokies lost on April 16, 2007, will be read. The Corps of Cadets will stand guard for 32 minutes. The candle will remain lit for 24 hours. Note: In the event of inclement weather, event updates will be posted to this page. “Holding the Light” an exhibit honoring those who lost their lives and those who were injured on April 16, 2007, will be on display in Newman Library’s 2nd floor Commons from Monday, April 8 through Thursday, April 18. The exhibit is a collaboration between the University Libraries and Student Engagement and Campus Life. A second major exhibit in the Newman 2nd floor Commons, “A community of Learners, a Legacy of Achievement,” will feature photographs of each of the 32 victims and a selection of books that reflect their individual disciplines and interests. A small garden space for quiet reflection outside of Squires Student Center’s Old Dominion Ballroom features the large inscribed rock received from Itawamba Community College, Fulton, Mississippi and stones from previous April 16th Perspective Gallery Exhibitions. Itawamba Community College planted a dogwood tree in honor of the victims, and this garden also includes a dogwood tree planted to honor those lost. The Virginia Tech Southwest Center in Abingdon will host its 12th Annual Remembrance Blood Drive on April 16 at the Southwest Virginia Higher Education Center in Abingdon, from 11:00 am—6:00 pm. Every donor will receive a free t-shirt. Contact Penny McCallum, Director, Virginia Tech Southwest Center for additional information via email to pmccal5@vt.edu or call 276-619-4311. Check back for additional details and events. Please join the Peninsula Hokies as we remember the 32 students and faculty who were tragically taken from us on April 16, 2007. This event is open to all Hokies, their families, and friends. We’ll be having a Pot Luck Picnic immediately following the walk/run at the Oozlefinch Brewery. We ask that attendees bring a dish to share. More info on this will follow as we approach the event’s date, check this page for details. We’ll be running and walking on the Fort Monroe Boardwalk. The run will start on the boardwalk directly next to the Paradise Ocean Club. There will be plenty of parking available. Please be there by 10:30 AM, so you can take part in our group picture. We’ll take the picture at 10:45 AM and then commence the walk/run immediately after. Contact Louise Schaeffler at weaze@vt.edu for more information. Join the Shenandoah Chapter for our 12th Annual Memorial Blood Drive with the American Red Cross. Food provided by Chick-Fil-A. To sign up online, visit the Red Cross website, www.redcrossblood.org, and search via date or location. Complimentary t-shirts will be given to all presenting donors while supplies last, just like the previous 11 blood drives. Contact Doug Ewell at dougewell@comcast.net or visit our Facebook page for more information. Visit our Facebook event for more information. Help us serve our community in more ways than one by volunteering with us at the Blue Ridge Marathon! Our alumni chapter has committed to providing TEN Hokies to assist with race logistics. For supplying these volunteers, the Blue Ridge Marathon has agreed to make a donation of $250 to our local scholarship fund! There are a variety of shifts and jobs available throughout the weekend. To register and select the type of work you would like to do (i.e. help with setup, man water or food stations, marshal runners, etc. ), volunteer here and select “VT ALUMNI” as the group affiliation to help us reach this goal. Ut Prosim! In memory of those who lost their lives on April 16, our Palmetto Chapter will be volunteering at the concessions to raise money for our next Virginia Tech scholarship recipient. We need 10-12 volunteers on that day for one concession; if we have more volunteers we may be able to staff a second concession. More details are on our Facebook event page. In remembrance of the 32 Hokies who lost their lives on April 16th, 2007, we invite our local Hokie alumni chapter, along with their friends and family, to join us for a remembrance 3.2 mile beach walk and cleanup on Saturday, April 13th, at 9am. We will be starting at the entrance to Mickler’s Landing Beach Park (off A1A and Ponte Vedra Blvd/Country Rd 203) in Jacksonville Beach) and walk north 1.6 miles, then turn around and walk back. Some trash bags and disposable gloves will be provided but if you have extra, please bring! Please RSVP to jaxvtalumni@gmail.com. We hope you can join us for this morning of remembrance and service. Please note, if there is inclement weather the day of the event please text Jamie Douglas at 757-630-7833 to confirm the event will still be taking place. To honor the memories of those we lost on April 16, 2007, we will be hosting blood drives with the American Red Cross to say thank you for the tremendous support that Virginia Tech received after the tragic event 12 years ago. Donating just one pint of blood can help save up to three lives. For an appointment, please visit https://www.redcrossblood.org/give.html/drive-results?zipSponsor=rvahokies or call 1-800-RED CROSS. Run/Walk will start on south side of the Crystal Pier at 9 AM. Ryan will be there to welcome you. We will double back to Crystal Pier and end at Bubs for a brunch from 10 AM to noon. Ut Prosim! In honor of remembering the events of April 16, 2007 at Virginia Tech, the DC Hokies are hosting our annual blood drive in Falls Church. This year we’ve teamed up with Inova for another great event. We hope you can join us! 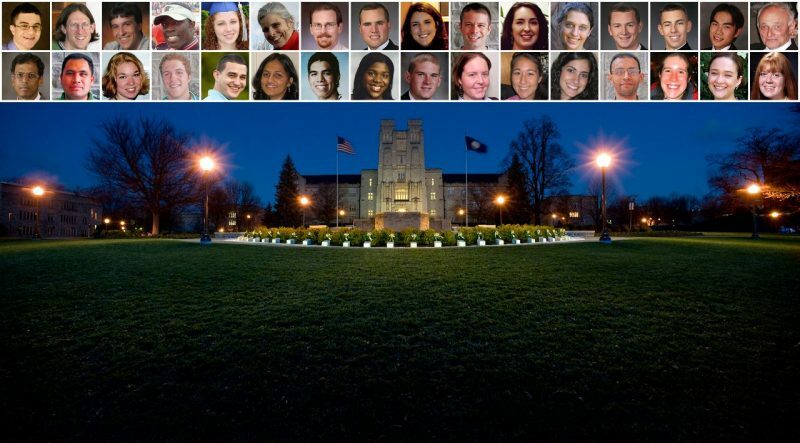 Join fellow OC Hokies in remembrance of the thirty two lives lost on our beloved campus in 2007. We will meet as a group at the pier and walk 3.2 miles along the coastline. Four -legged Hokies are most welcome! Please stay with us afterwards as we gather for lunch. Contact Grant Gardner for more information. Immediately after April 16, members from Ben’s Bells came to Blacksburg and placed 32 Bells around the campus and community to offer healing and a reminder that kindness and caring prevails. Ben’s Bells are handmade works of art that are hung in unexpected places for people to find, and we’re looking for your help! Join the Nashville Hokies as we place Ben’s Bells around our own community to spread the message of kindness and caring in remembrance of the events of April 16, 2007. Unable to make these events? Email us at tnhokies@gmail.com, and we’ll make sure you get bells to distribute. On Sunday, April 14 we are asking all who have picked up Ben’s Bells to put them in public places in their community. Interested in learning more about Ben’s Bells? Visit them online, bensbells.org. Visit our Facebook event page for sign-up details. More details will be posted on our Facebook page. The Philadelphia Chapter of the Virginia Tech Alumni Association is hosting a walk/run in memory of the victims of the April 16, 2007 tragedy at Virginia Tech. The course will include two distances—a 3.2 mile (just over a 5K) and a 3.2K. This is a family and friend-friendly event (including your 4-legged friends. We hope you can join fellow Hokies in remembering. Suggested donation to participate is $10 per adult (children free). Donations go to cover the costs of the event. Remaining donations will go toward the chapter’s scholarship fund, given each year to one or more deserving incoming Virginia Tech freshmen from the greater Philadelphia area. Pre-registration by April 10 is preferred but not required. Contact philadephia.hokies@gmail.com with questions or for more information. Each year, we gather together to pay tribute to the 32 students and faculty members who were tragically taken from their loved ones and our VT community on April 16, 2007. We’ll provide water and light refreshments. Feel free to bring your family, friends and pets and be sure to wear lots of orange and maroon. We’ll meet near the picnic shelters and playground at the corner of Dudley Lane and W. Wieuca Rd NW. We’ll be meeting at the Larder in North Augusta at 10:00am, making two loops around the Greenway Riverfront Loop and ending up back at the Larder. It’ll be lunchtime and we can get together for lunch at the Larder. Let us know if you’ll be participating by April 10th. Visit our Facebook page for more information: https://www.facebook.com/CSRAHokies.